Perfectly Pamela: 21 weeks, 6 days! How far along: 21 weeks 6 days! 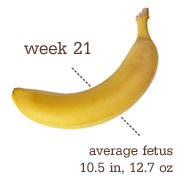 Size of our baby: A banana. Total weight gain/loss: Total gain: 4lb. Maternity clothes: All maternity bottoms but I can still wear a few of my pre-pregnancy sweaters. Stretch marks: Nothing and hopefully I can keep it that way! Sleep: Still up during the night about 3 or 4 times to pee and Drew always wakes me up when he comes to bed. Movement: All the time now! Even Drew has been able to feel some of her more stronger kicks. She's a mover and a shaker! Food cravings/aversions: Candy - mostly chocolate candy like reese cups and butterfingers. Belly button in or out: In. And I'm pretty sure its going to stay in. What I miss/What I am looking forward to: Looking forward to finally starting the nursery. But that won't happen for another two months. Weekly Wisdom: If it's a girl, she's already got a lifetime's supply of eggs in her womb -- about six million of them!